Are you still going to do morning rave? Im a fan of your blog since about a year. Thanks for the great work! I wanted to ask you if you know a band called Sabot, from the U.S., but for a long time working and living in the Czech Republic. They are a bass/drums duo (couple). I went to a show last week and it blew my mind. Been searching for some of their records around the internet and cant find absolutely nothing. If you know them, it would be greeaat if you could post something. If you dont, chek them out, they are great. The track that is misscalled "20 Can" on this record. Is it really from Can???? Its the song from whom Lovage (Mike Patton) sampled for one of their songs instrumentation, Kid Koala was the Dj. Anyway, is that song really from Can and to which of their recordings does it belong? I would be so happy if anyone could tell me. The name of track is actually "Kama Sutra"
I don't recognize it at all and I have no idea what Can album it's from. Suppose I should have been tipped off to their inclusion on this comp by the track label, but I was listening to this one in my car so I didn't have any info in front of me. you're in kalamazoo? i was there 8/05-6/06 at k college. had mental problems, grew a big beard and threatened to become a mountain man, but i had too many records. Keep up the good blog. Hey, great! 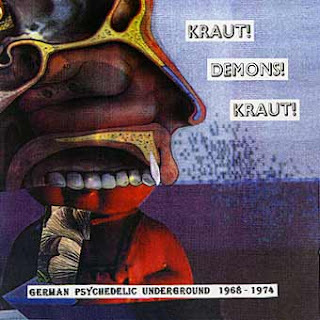 I just stumbled into your blog and I discover my old Kraut Demons-comp. I compiled this one a long time ago and there never was a vinyl edition. But we've released 3 more rare Kraut CD-comps during the 90s called "Hungry Krauts,Daddy", "Obscured By Krauts" and "Kraut-Bloody-Rageous". The Can (Inner Space) track here is dubbed directly from the video-tape of the "Kama Sutra" movie, and was unreleased until the entire Soundtrack has been released last year. Here's good news, maybe... The series continues. But the new volumes are online-only compilations. You can download free on spurensicherung.blogspot.com : "Kraut Mask Replica" and "Tune in Turn on, Drop Kraut" Lots of unreleased Can gems spread across these volumes. Yours, The Lolly Pope.